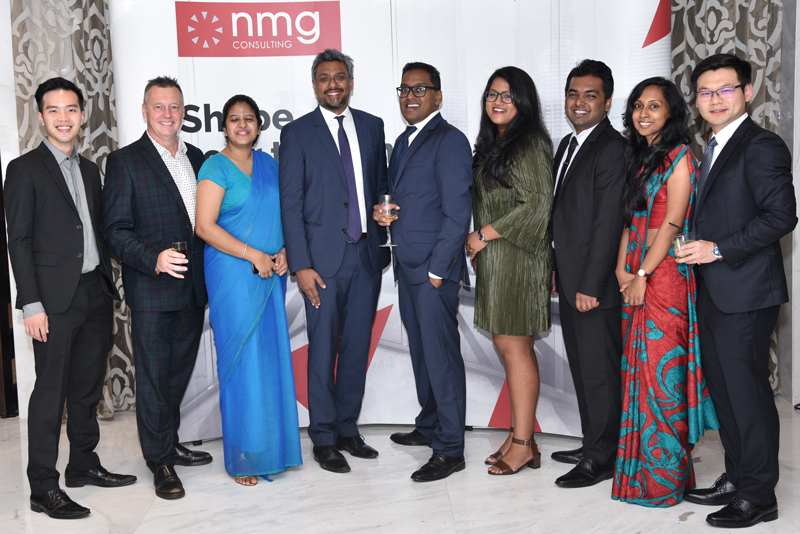 Sri Lanka, May 24, 2018 – NMG Consulting held its annual Insurance Connections event for friends, clients and colleagues within the insurance industry. The event, hosted by NMG Consulting Partners Mr Roshan Perera and Mr Matthew Maguire, puts the spotlight on the evolving insurance landscape and shares the innovative work NMG is doing to drive the industry forward. NMG has been providing advisory services to the Sri Lankan market for 25 years and is the largest provider of general insurance actuarial advisory services (providing statutory sign-off for 11 of the 14 general insurance portfolios in the market). In recent years, NMG’s services in Sri Lanka has expanded and now includes advice to banks and conglomerates, as well as providing strategic life insurance consulting around portfolio and distribution optimisation. NMG is also heavily involved in the mergers and acquisitions space, having brokered the recent Allianz/Janashakthi transaction together with its local investment banking partner, Capital Alliance Partners Limited, earlier this year. In his opening address, Mr Roshan Perera described the vertically integrated model that allows NMG to use analytics to support industry insights, which ultimately allows the firm to advise management on more strategic “fork in the road” decisions. Perera’s address was followed by Mr Nick Li, a Principal Consultant based in Singapore, who discussed NMG’s strategy proposition and the type of work the firm conducts in Asia. Li discussed NMG’s expanded strategy proposition, highlighting the advantage of leveraging data analytics to inform insurers on distribution strategy, identifying operational changes and new markets. He also discussed the increased use of ‘big data’ and data analytics by insurers across the region, which resonated with the participants within the local market who are increasingly looking to use technology as a differentiator. Mr Siva Kumar, NMG’s technical lead based in Kuala Lumpur, followed by sharing insights from a Malaysian based study highlighting the impact of changing regulation in the motor insurance space. Kumar presented the findings on the competitiveness of motor premiums following the recent de-tariffication. He talked about how free market pricing has led to increased price competition and how the study can help insurers understand their competition better through granular risk segmentation. He also presented results which showed the extent of price differentiation employed by Malaysian insurers by key risk factors (such as make and model of vehicle, geographic location, etc). He highlighted that this type of analysis would be beneficial to insurers in Sri Lanka who are having to manage their portfolios in a more competitive environment while meeting new regulatory capital requirements. Mr Matthew Maguire finished the formal part of the evening by announcing the highlights from NMG’s recent statutory work into the general insurance market in Sri Lanka. Recent changes in the industry landscape have shown a shift from local insurers dominating the Sri Lankan insurance market to foreign insurers entering the market through mergers and acquisitions. This has led to increased competition amongst the mid-tier peers for a smaller share of the market premium (which has shown double digit growth over the last three years). NMG highlighted that companies operating in Sri Lanka have to think more strategically about their underlying business, and the consequences from a risk-based perspective, while developing an analytics driven culture which will capitalise on available information. To address the increasing challenges and requirements in the market, NMG Consulting has strengthened its team in Asia with three qualified actuaries focusing on strategy (Mr Nick Li), technical services (Mr Siva Kumar), and reinsurance advisory services (Mr Choong Hern Ooi). NMG Consulting is the leading multinational consultancy focusing solely on investments, insurance and reinsurance markets. We work with financial institutions (insurers, reinsurers, fund managers and pension funds, banks and brokers) to shape strategy, implement change and manage performance. Our vertically integrated model – high impact consulting backed by the ‘information advantage’ arising from our proprietary research and analytics programmes – is a unique point of difference in a crowded market. NMG Consulting has ~100 employees, spread across offices in Sydney, Perth, Singapore, Kuala Lumpur, Colombo, Cape Town, London, Toronto and Kansas City, and was established in 1992. NMG Consulting is a subsidiary of NMG Group, which is a privately held company based in Singapore, focusing on non-banking financial services. NMG Group has ~1,000 employees, spread across offices in 18 cities, and on five continents. The group includes industry leading firms such as Boobook, iGo4 and NMG Benefits in South Africa. For more information on NMG Group visit the website: nmg-group.com.